You’ve probably heard the age-old expression, “it takes a village to raise a child.” But how often do we explore where our children can give back to the village? Between sports, school, music lessons and family time, it can be challenging to find time to incorporate community service into your child’s routine. But you could be missing a huge opportunity to build your child’s character and confidence. Elementary age students: Responsibility. Getting children involved in community efforts beyond their usual 4 walls opens their eyes to the world around them, meaning they learn responsibilities and the reasons behind them firsthand. Middle Schoolers: Leadership. Children are capable of becoming leaders at young ages, and community service is a great way to help them build upon these skills. Getting your child involved in the community also helps them learn the confidence and planning tools they need to problem solve and be a leader. Teenagers:Innovation with purpose.Don’t let the aloofness your teen may have recently adopted fool you. Teens care a lot. Sometimes more than they can express. Give them a healthy outlet by listening to what they care about the most…current social issues, animal rights, or whatever it may be. Support them by offering resources and encouragement as they find their journey to contributing to a purpose and creating the change they desire. 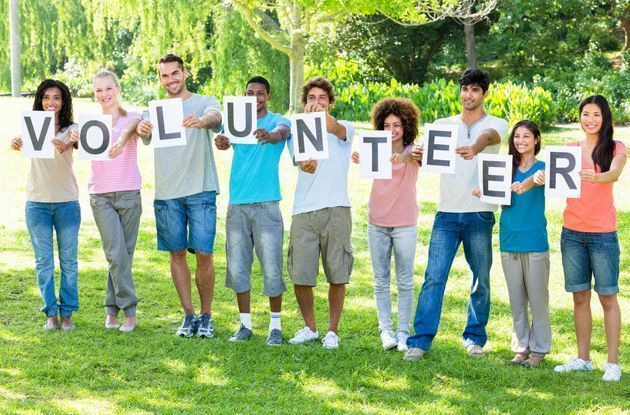 No matter the age, community service strengthens the ability to empathize. Increased empathy increases self-awareness, confidence, and overall mindfulness. You’ll never cease to be amazed by the growth of your child through community connection. Read on to find creative ways to get your child involved the community at any age. Kids are naturally fascinated with the world and people around them. Help them move from observation to interaction (and help make others smile) by creating small surprises for community members. Encourage your child to give it out when they notice someone being nice to them, and watch their happiness grow when they learn to see the good all around them. Do you have a Bob the Builder on your hands? Or a total lego-maniac? Habitat for Humanity brings community members together to build home for those in need. They operate nationwide, and have teams and positions for volunteers as young as 5 years old. Imagine your child’s confidence grow from realizing they’re helping build homes for others in real life! Observe what makes your kid “tick,” whether it be art, music, cooking or sports. Then, discuss where they see a need in their community. For example, if bullying bothers them, look up local or national anti-bullying programs. 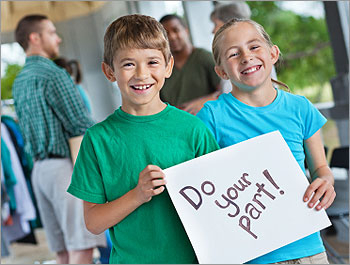 Next, help them find a way to use what they have fun with to give back to the cause you found. For example, if they enjoy art and have a soft spot for animals, maybe they would enjoy putting together an art show with other students to raise money for a local shelter. Get your child off their iPad and outside in a fun new way that helps others, too. Bring them to a local animal shelter to explore volunteer opportunities like dog walking. If your child is too young to take the dogs off premises, think of other ways to give the pets some love, like in-shelter playtime or making homemade toys and treats to donate. If they’re set on dog walking, offer to help an elderly neighbor with their pets. This is a great one for your young athlete or organizer. It’s not always feasible or safe to send our kids around the world to learn about other cultures. But luckily, there are opportunities in your own neighborhood for your child to immerse themselves in a new culture. Choose a local refugee center, or children’s shelter that has a mission your child can get behind. Then, help them plan a field day where the kids can have fun and be kids! Once your activities and details are planned, help your child contact the proper programming people to propose your field day to. Help your child think about some of their physical activities they've participated in and choose one's that will help the kids not only have fun, but bond with each other and cultivate self-confidence. If your child likes to shop, this will be a refreshing break from the usual mall routine. Make a list of toiletries that women need, or that your child already has and may take for granted. Go shopping for the items, and make them into gift packages for a women’s shelter. Make sure your child gets to be there for the delivery so they can absorb the impact of their good deed. There’s nothing like the great outdoors, and no better time to enjoy it than that stressful transition from middle school into high school. The National Park Youth Conservation Corps has programs for youth, teens, and young adults. The teen program gives teens the important duty of helping to protect the natural, historic and cultural resources in national park sites. It’s a summer employment program that engages teens in important assignments like trail building, teaching environmental education, and historic building preservation. Not to mention all the opportunities to get outside and explore! Lion’s Heart groups are groups that meet all around the nation to organize volunteer and leadership efforts for teens. Teens are organized into groups of 3-20 by age range and gender. Each group of teens elects their own officers, meeting dates, and community mission with the support of the umbrella organization through educational materials and other handy resources. There are kids everywhere who could use a safe place to be themselves with some extra love and support, and camps like The Hole in the Wall Gang camp provide that. Hole in the Wall provides a getaway for kids with chronic illness and their families to experience the vacation they deserve. If your teens have a soft spot for children, a knack for leadership, or simply want to try something new, help them find a nearby camp like Hole in the Wall where they can feel needed, loved, confident, and ready to take life on with gratitude. Watching your child blossom while impacting the lives of others is something you certainly won’t regret. It may even inspire you to get a bit more involved yourself!